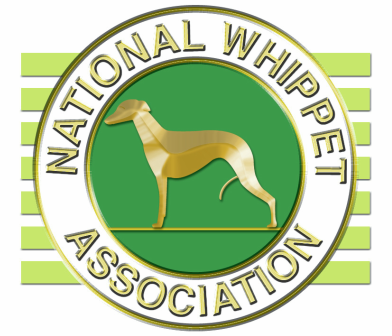 The National Whippet Association hold heart testing clinics at the annual Championship Show. Booking in will commence when the show opens (from 9am), you will be given a number to say you have paid and in order we can keep track of how many dogs are booked in/left to screen. Please click below for the results from each year. Firstly, thanks to all those who participated in the Breed Council Health Survey, I was told by both the KC Health Information Officer (who analysed the data for me) and a friend, who is a statistician by trade, that the response was extremely high although it may not seem it when you read the figures considering the number of Whippets that are registered with the Kennel Club in any one year. As you will note, murmurs were by far the most common cardiac condition. However, to put this into context, from the information given by owners, the majority of those dogs with murmurs were neither on medication nor showing clinical signs and most lived to normal life expectancy. This does not mean we should become complacent but I believe the conclusion can be drawn that neither have we any real concerns with the breed’s health. 263 individuals responded to the invitation to complete a Whippet Breed Council Health Survey circulated during 2011/12. The average length of time that respondents had owned whippets was 16.6 years (n = 257, min = 0.5 years, max = 60 years). Participants currently owned an average of 2.8 Kennel Club registered whippets (n = 257, min = 0, max = 12) and 30.2% (58/192) had bred a litter between January 2005- May 2012, while 69.8% (134/192) had not. 71% (159/224) participate in showing, 18.3% (41/224) in racing, 14.3% in obedience, 13.4% (30/224) in lure coursing, 9.4% (21/224) in agility, 1.3% in flyball and 16.1% in "other". Of these respondents, 73.7% (165/224) participated in only one activity, 14.7% (33/224) in two, 8% (18/224) in three, 1.3% (3/224) in four and 2.2% (5/224) in five. 64.3% (169/263) of Whippet owners said that they did not have any health issue to report, while 35.4% (93/263) did. 58 respondents provided information on litters that had been bred between Jan 2005 – May 2012, accounting for 136 litters. Where specified, 12.3% (15/122) of litters were produced via caesarean section, while 87.7% (107/122) were not. An average of 6.5 puppies were born per litter (866/136), with a maximum of 12 puppies being born in 3 instances. 47% (401/866) of the puppies born Jan 2005 – May 2012 were female and 53% (453/866) were male. 14 litters were reported to have had instances of puppies being born dead (min = I puppy dead per litter, max = 12 puppies dead per litter). 19 litters were reported to have had at least one puppy die between birth and weaning (min = 1 puppy dead per litter, max = 5 puppies dead per litter). The cause of death of these puppies was described in 11 cases (4 cleft palates, 2 lack of oxygen during birth, 1 fading, 1 fluid on lungs, 1 rejected by dam, 1 seizures and fading and 1 severe umbilical hernia). 42 litters had at least one puppy born with retained testicles, accounting for 54 puppies in total (min = 1 puppy born in a litter with retained testicles, max = 4 puppies born in a litter with retained testicles). 263 respondents provided information about 809 dogs, of which 430 were male, 332 were female and 47 were not specified. The average age of the dogs described which were still alive was 5 years old (n=618, min = 1, max = 17, mode = 1), and the average age of those that had died was 11.4 years old (n=128, min=1, max = 19, mode = 13). In 54 instances the dog was not specified to be alive or dead. Of the 809 dogs, 239 dogs were said to have/have had health issues (121 living dogs, 112 deceased dogs and 6 unspecified). Participants were asked to define these health issues by placing them into predefined categories. 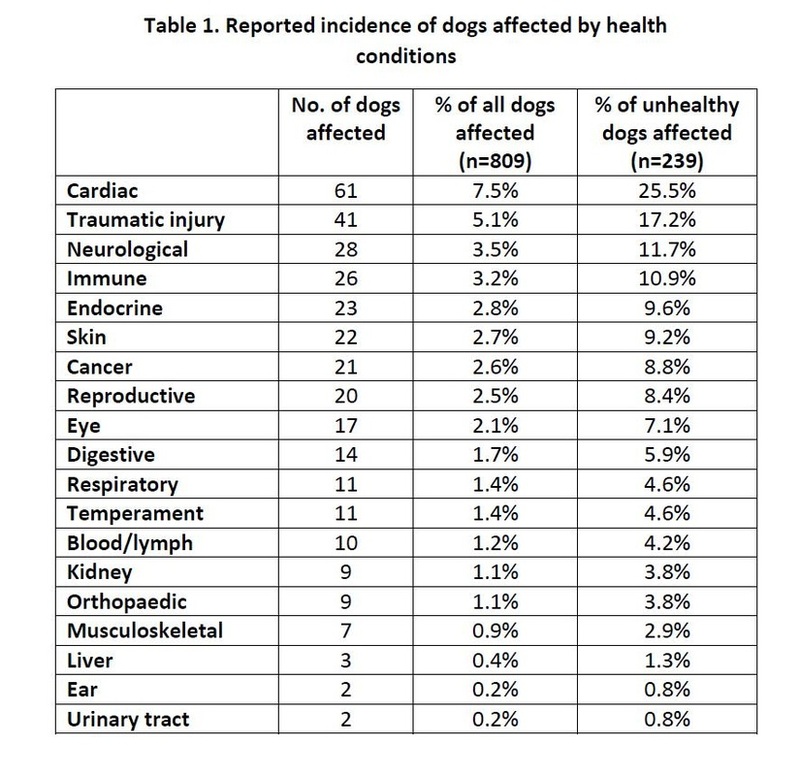 The most commonly reported health issues were cardiac conditions (61 dogs), traumatic injury (41 dogs) and neurological conditions (28 dogs). See Table 1 for a breakdown of these conditions. 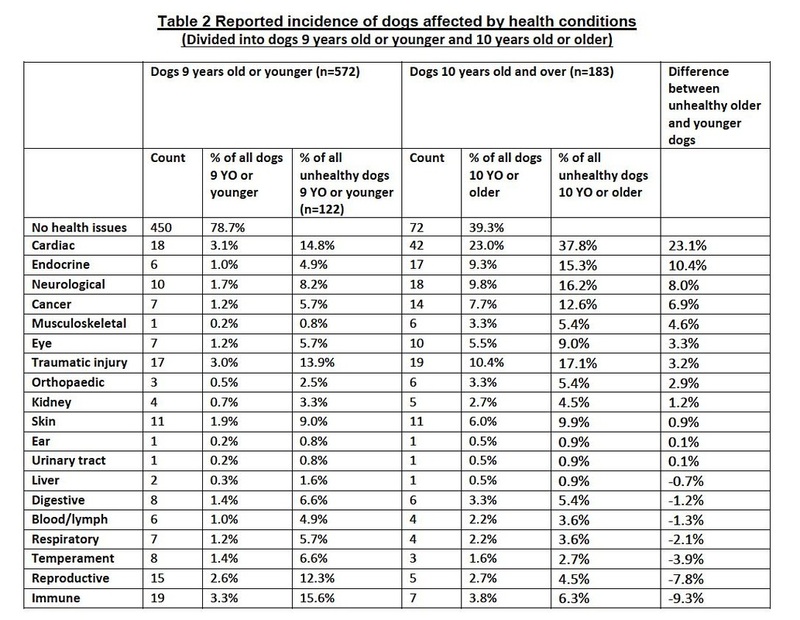 Data regarding dogs affected by health conditions was broken down into dogs 9 years and younger and 10 years and older. Older dogs were reported to suffer from cardiac, endocrine and neurological conditions more frequently than younger dogs. Younger dogs were reported to suffer from immune and reproductive conditions more frequently than older dogs. The results for this breakdown can be found in Table 2. Unresponsive immune mediated problems (pts at unknown age).